As mentinoned in my previous post, I've just been involved in a discussion group over at PA Consulting, so I seemed a good time to note down some more observations on meetings in SL. I've always been a champion of virutal meetings, and consider the avatar a key component in the meeting's success..... something about making the session seem more "real". 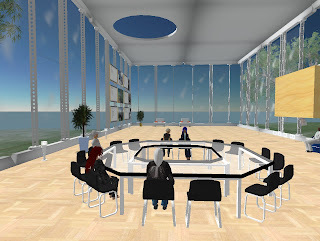 Today, perhaps, I could have managed without my avatar... but then it was good for introductions; and it was also clear that there was someone else sat in the room (not necessarily taking part in any discussions) who was taking notes.... so the avatars were useful after all! The chat log was essential.... I was sitting at home for the meeting, and true to form, the rest of the household came up with 101 things for me to do immediately - so I rather rudely left my avatar to hold the fort in the meeting, whilst I rushed round solving domestic problems! When I came back to the keyboard, I was quickly able to look back at what had been said in my absence, and catch up on the discussion thread. I have since been able to refer to the chat log to refresh my memory of what was said. IM proved useful - re-establishing old relationships with participants, without distracting everyone else. There was a slight problem with people "speaking" at once, but it was soon possible to unscramble the conversation threads from the log. At least we didn't have to deal with thick foreign or regional accents... all the discussion was in chat. So, overall, the meeting was a success. I don't think it would have been quite so easy had we had voice to play with, but that's for another discussion!! !